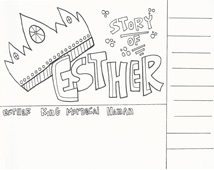 Esther's story is found in the book of Esther of the Old Testament. She was chosen by the king to be queen of Persia because he loved her very much. Esther's guardian, Mordecai refused to bow down to Haman who was a high official of the king. Haman gets upset and plans to destroy all the Jews. Esther hears about his plot and goes to the king and pleas for the protection of her Jewish people. The king hangs Haman. Esther's faith and courage saves her people.